I am on team pumpkin when it comes to fall. even more so when it's accompanied by chocolate chips or cinnamon or anything fall spice-ish. i'm also a fan of breakfast. put these two together? 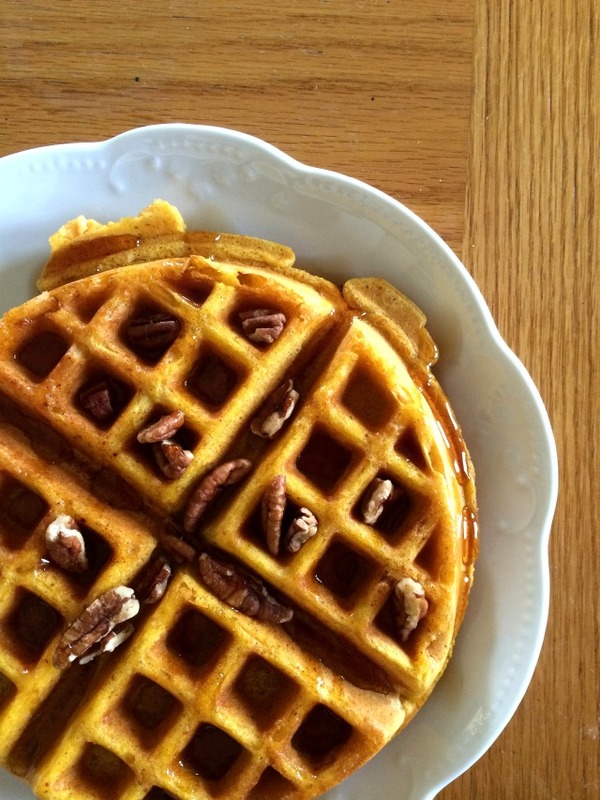 pumpkin pecan waffles. one of my favorite breakfast restaurants had one that was sinfully good but they shut down last year... womp womp. so when i got the hankering for one this year, my friend and i did some googling & found this recipe. well, yum. they turned out great (as if i suspected otherwise). we didn't make the maple pecan cream to go with, we just topped with pecans and used syrup, but i'm sure that stuff is dang good, so YOU should make it if you do this recipe & let me know how it is! i experimented again with these, added chocolate chips & skipped the pecans, and i could have eaten only those for a whole day they were so good.